We know what you’re thinking. “Summer is just 6 weeks away. I need to get in shape!” With New Year’s Resolutions long forgotten, most of us are in shape (if round counts as a shape, that is.) Obesity is a national epidemic that millions of Americans are facing today. With 68% of adults (and one out of every three children) in the U.S. overweight or obese, it’s no wonder that combating obesity is a leading concern across the nation. The HWCF, or Healthy Weight Commitment Foundation, is a CEO-led effort made up of more than 200 organizations and is designed to help reduce obesity, with a focus on childhood obesity, by 2015. Eating a healthy, balanced diet and increasing physical activity are two key points of the HWCF goals. The Foundation promotes programs and activities that are designed to help people achieve and keep a normal, healthy weight. 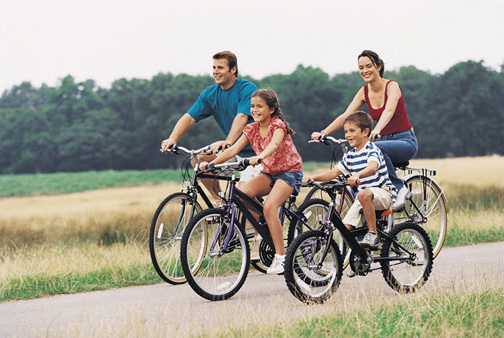 The Together Counts™ campaign promotes the advantages of family meals and physical activity. Inspired by the HWCF, we began hosting a “Lunch & Learn” where employees would gather to enjoy a healthy lunch, while getting an education on wellness and improved quality of life. In September 2011, we formed a “Walk-a-Mile” club to encourage each other to get moving. Whether taking a short walk outside during break time, or hitting the gym after work, every mile counts. We have since logged nearly 5,000 miles! Making huge lifestyle changes can seem like a daunting task. Start with small changes and team up with friends or family. Studies show that having support provides the motivation to keep going strong! Park & Walk: Try to park farther from your destination and get in a few extra steps. Drink More Water: Can’t seem to eliminate soda and other sugary drinks? Start by swapping out just one soda per day. Skip Dessert: Many of us crave sweets after a meal. Have a piece of fresh fruit instead. If you still can’t get rid of that sweet tooth, opt for a small piece of dark chocolate. Tell us what strategies have worked for you. Now let’s get moving!